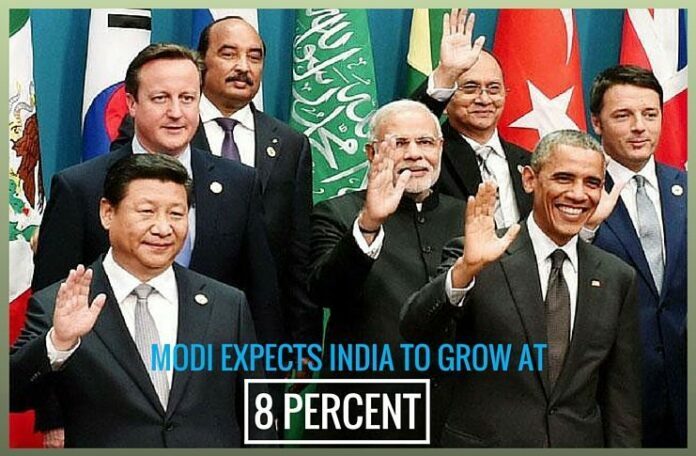 [dropcap color=”#008040″ boxed=”yes” boxed_radius=”8px” class=”” id=””]P[/dropcap]rime Minister Narendra Modi has projected an 8 percent growth rate for India next year and pushed for a grand alliance of solar-rich nations, even as he sought a united stand of humanity against terrorism in the wake of the terror attacks in Paris. In his intervention at the G20 working session in this Mediterranean city in Turkey on “Inclusive Growth: Global Economy, Growth Strategies, Employment and Investment Strategies”, Modi said India was likely to grow at 7.5 percent this year and achieve a growth rate of 8 percent-plus next year. He said India has reduced inflation and current account and fiscal deficits and its programmes of inclusive development, financial inclusion, universal access to basic needs, Make in India, Skill India, Digital India, Industrial Corridors and Smart Cities would boost growth and employment in the country. “This will be a source of strength for the global economy,” he said. [dropcap color=”#008040″ boxed=”yes” boxed_radius=”8px” class=”” id=””]T[/dropcap]he prime minister said “global economic growth remains weak, with slowdown in several major economies, volatile financial markets and competitive devaluation of currencies”. “To stimulate growth, we need to enhance public investments, not just rely on monetary policy. G20’s continued call to central banks for careful communication on monetary policy actions will be helpful in keeping financial and currency markets stable,” Modi said. He said multilateral development banks should enlarge their capital base to support infrastructure needs of the developing countries and noted that new institutions such as the New Development Bank — referring to the BRICS bank — were welcome additional sources of financing. [dropcap color=”#008040″ boxed=”yes” boxed_radius=”8px” class=”” id=””]E[/dropcap]arlier, in his lead intervention at the working lunch of the G20 working lunch, he said the group should ensure finances and technology worth $100 billion be made available for countries to pursue clean energy during their development, and pushed for its proposal for a grand alliance of solar-rich nations to make this key source of green power an integral part of people’s lives. “At G20, we can play an effective role in supporting the multilateral goals of increasing research and development to develop affordable renewable energy. We must also ensure finance and technology is available to meet the universal global aspiration for clean energy,” Modi said. “We must meet the target of $100-billion goal per year by 2020,” said the prime minister in this Mediterranean resort, ahead of the crucial meeting of the Conference of Parties (COP) in Paris from November 30 to December 11, under the aegis of the UN Framework Convention on Climate Change. [dropcap color=”#008040″ boxed=”yes” boxed_radius=”8px” class=”” id=””]T[/dropcap]he prime minister, who arrived here late Saturday from London, said India itself has agreed to do its bit for a clean-green world. This, by committing an additional capacity of 175 GW of renewable energy by 2022, cutting subsidies on fossil fuels, taxing the use of coal, and setting up a National Clean Energy Fund of $3 billion to promote clean technologies. Ahead of the start of the G20 Summit, Modi called for a united global stand against terrorism in a meeting of the BRICS leaders following Friday’s mayhem in Paris that claimed 129 lives. “We stand united in strongly condemning the dreadful acts of terror,” Modi said as the leaders of Brazil, Russia, India, China and South Africa met at the sidelines of the G20 Summit two days after Islamic State terrorists massacred 129 people in the French capital. “Entire humanity must stand together and be one against terrorism,” he added. Modi said India attached the highest importance to BRICS. “We want to build on the great work done by other members,” he said, adding that India would be honoured to assume the BRICS chair from Russia in February 2016. “Build responsive, inclusive and collective solutions… this will be the theme when India assumes presidency of BRICS,” Modi said. The prime minister said that BRICS has proved its relevance and value through its actions, when earlier its logic was being questioned. [dropcap color=”#008040″ boxed=”yes” boxed_radius=”8px” class=”” id=””]I[/dropcap]n another significant development, India and Australia completed all procedures of the civil nuclear agreement that was signed in New Delhi last year during then Australian prime minister Tony Abbott’s visit. “Another milestone achievement as 2 prime ministers announce complet’n of procedures for #IndiaAustralia Civil Nuclear Agreement,” Vikas Swarup, spokesperson in the external affairs ministry, tweeted soon after Prime Minister Narendra Modi held a bilateral meeting with new Australian Prime Minister Malcolm Turnbull. “With the completion of procedures, including administrative arrangements, the #IndiaAustralia Civil Nuclear Agreement will enter into force,” Swarup stated. “Thank you @narendramodi for a very good discussion about our strategic and economic priorities,” Turnbull tweeted later on Sunday. On Sunday, Modi also held bilateral meetings with Presidents of the European Commission and the European Council, Jean-Claude Juncker and Donald Tusk, on the sidelines of the two-day G20 Summit meeting here.